I upgraded to Mac OSX Mavericks yesterday. After the upgrade the finder window keeps on closing and restarting. It is quite annoying as it happens almost every one minute. After a quick google I came to know that other users have been having the same issue. The quick solution after going through the linked post is to disable google drive integration with finder, which is not working well and crashing causing finder to get restarted. Amazon launches Kindle Fire HDX quad-core tablet range – Tablets – News – HEXUS.net. After Apple I personally think that Amazon is making all the right decisions in the Tablet market. The new additions to the tablet range are impressive. I bough a kindle fire HD for my daughter few months back, and it has become her all in one device, for reading books, playing games and studying online. Taking into account that it is half the price to a similar size Apple device I am happy with my decision. SharePoint is great as a framework, and developers find it great to develop on top of it. However the share lack of business specific focus makes it a very difficult application to work with when it comes to using it to meet a specific business need. Although each business has its unique requirements, however there are industry specific norms that are common, and an application that can address industry specific needs makes it a easier win. IT teams find it a challenge to use the sharepoint framework capabilities to meet the specific business needs, but in doing so it ends up being a bigger job then it would have been to develop a custom application to meet the needs. Hence a customisation which ends up taking a year or so, is already outdated, and possibility is that Microsoft might already be coming out with a newer version with capabilities that the IT team has custom developed over a long time. SharePoint provides capabilities in the form of Widgets, however the built in templates do a very poor job bringing together these widgets to provide a solution. Most of the templates are focused towards technical needs rather than business specific needs. In my view what can make a huge difference in SharePoint adoption is to provide business specific templates to address specific business need. SharePoint team now needs to eat their own dog food and use their framework to provide business applications. This can be a set of templates that provide a starting point for say a law firm or a financial institute. The learning from desperate efforts of various organisation within the same business line need to be harnessed to provide industry specific solution which is a superset of these desperte implementations. The webpart uses the categorisation and tags for the content to show related contents within sharepoint. Over the past few years I have observed few reasons which cause a scope creep during project delivery. I wanted to document this for my own future benefit and any other unfortunate souls out there who have to face the same situation. Who is out consultancy client and why does that matter? Time and time again it seems that we are challenged in projects to close off the scope and meet the client requirements. One of the key reasons of not being able to close off scope and meet the requirements is to determine the Client within stakeholders. We generally take the person who acts as the CLIENT CONNECTION to be the actual client and follow requirements set forth by him, but most of the times it turns out that actually our client was the manager of the person we have been communicating with, and when it comes to making a decision of wether we fulfilled the requirements or not, it turns out that the our CLIENT CONNECTION had limited decision power. Chances are that for each engagement there will be multiple stake holders for our consultancy service, and each stake holder has his own agenda, and its hard to get a final decision from all of them, so the only way forward for us is to act as a mediator between the stake holders(or use one of the client contact as the person who will resolve conflicts), as long as they agree to some extent between them, and we have a written agreement of requirements we will be fine, otherwise we will not be able to fulfil our goal, and achieve the required acceptance from stake holders. Fulfilling requirements for all individual stake holders will always result in loss of profit and trust from the Key Client. Update 29th June 2011: Seems I for some reason started to see features for Google plus . Google plus is the new social network from google with google circles to allow people to add people to their network, Hangout for video sharing, and sparks to show you content specific to the topics you are interested in. I was surprised to see quite a few changes for me on google search today, and it seems that not everyone is seeing the same changes as I am, maybe its got to do with me using Chrome, and my preferences. Do I like them? Considering that the background image can be turned on and off for each person its basically up to ones own choice, but as far as the top navigation is concerned I did not chose it to be black, however to me its quite refreshing, as it gives me a much better visibility of the navigation and other options available to me. It surely bring to my attention all the other features that are available within google. I wonder if google is trying to be as agile with its release process as facebook, through which they want to experiment and based on user response decide to keep a specific feature or not. 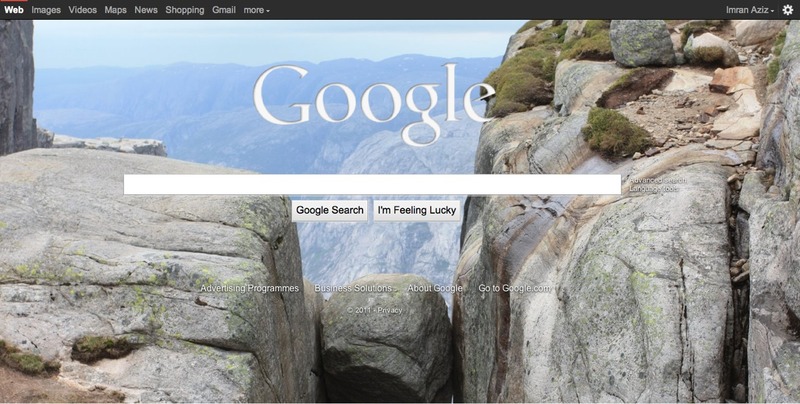 One thing is for sure, no matter how big you are you are bound to steal clever ideas from competitors, however in this instance googles use of background image is not as clever as bing (What is it? idea). Google doodle is original and works for me. I was really frustrated to realised during a client demo that the search results were not working on a fresh install of SharePoint 2010, after a little bit of investigation I realised that it was a simple action of indexing the contents in SharePoint 2010 and setting an Indexing Schedule. Navigate to CA, Service Applications, Search. You will see a link to your Content Sources. If you edit that it will give you the opportunity to setup a schedule for both Full and Incremental indexing. You can kick off a full drawl, once completed you will have results if everything is configured correctly. Tagging is one of the Social Software features that has been out there for some time but from my experience very few people use it and find it useful. From my understanding its more the issue of not fully understanding how tagging can support findability and serendipity rather than the feature itself. Tagging is one of the many ways that search becomes a richer experience. Folksonomies are unstructured and managed using Enterprise keywords. Distribution of tagging into these key concepts allows a much richer use of tagging and brings home tagging to the enterprise. Please read Managing Metadata in SharePoint 2010 to get a detailed view of this SharePoint 2010 feature .